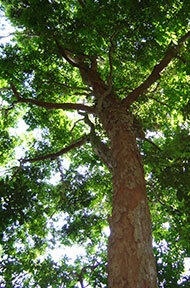 Pernambuco is a medium-sized tree that can reach heights of about 20 meters. The International Pernambuco Conservation Initiative (IPCI) was created out of concern for pernambuco (Caesalpinia echinata), a species of tree native to Brazil’s Mata Atlântica, or Atlantic Forest. 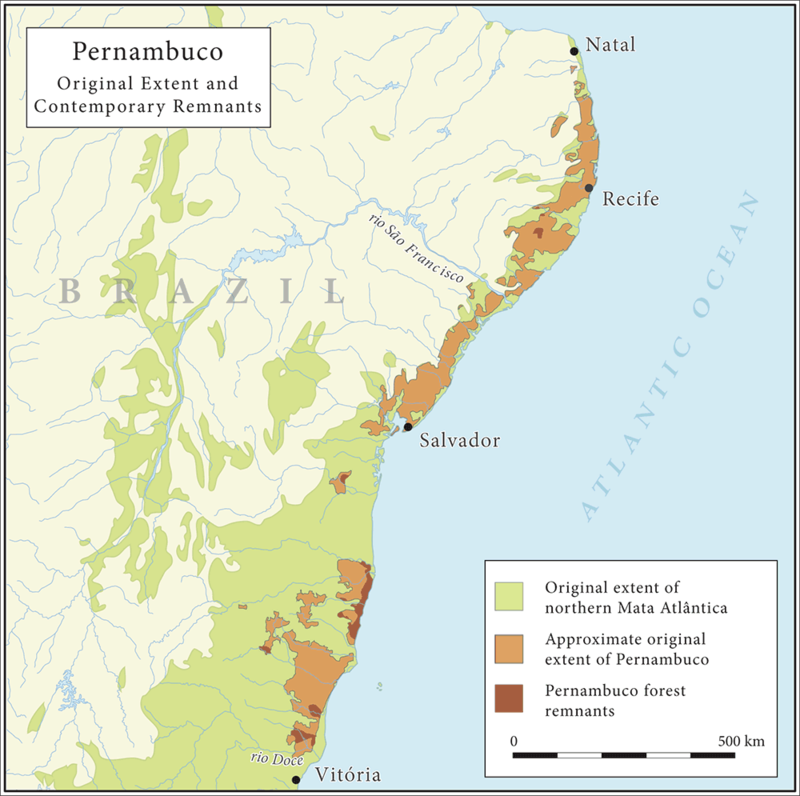 Following the discovery of the Americas by Europeans, pernambuco, which is also known as pau-brasil, was commercially harvested and imported to Europe for dye making. As a result of this intense exploitation, pernambuco was already in steep decline by the 18th century, when François-Xavier Tourte recognized the exceptional qualities of its heartwood for bow making. Today, more than 250 years after Tourte first made pernambuco a popular choice for bow sticks, no comparable substitute is known to bow makers or musicians. The rigidity, flexibility, density, and beauty of this wood, combined with its ability to hold a fixed curve, makes pernambuco a unique material that is essential to the craft of bow making and to the musicians who use these bows. Previously, lighter-density European woods or other tropical woods had been used by bow-makers. Some of the tropical woods, such as massaranduba, snakewood, and Swartzia, were referred to as “ironwoods” owing to their remarkable density and hardness. Within a short time, pernambuco replaced all these other woods because the quality of sound it produced was much favoured by musicians and because its physical qualities make it an ideal material for crafting cambered bow-sticks. Pernambuco is a slow-growing, medium-sized tree of the Leguminosae family. 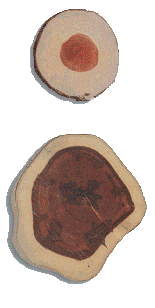 Its heartwood varies from orange brown to reddish brown or dark wine red, and darkens upon exposure to light after the tree is cut. This coloration is distinctly different from the whitish or yellowish beige of the sapwood. The tree does not begin to produce the hard dark heartwood for which it is renowned until it is 10 years old and the heartwood only becomes dominant after 20 years. A reforestation program in the state of Pernambuco has shown that a properly pruned and cared-for tree will produce heartwood suitable for bow-making in thirty to thirty-five years as opposed to the 80 to 100 years required for a tree in the wild. The pressures on contemporary pernambuco stocks are by no means due exclusively to demands for the wood itself. 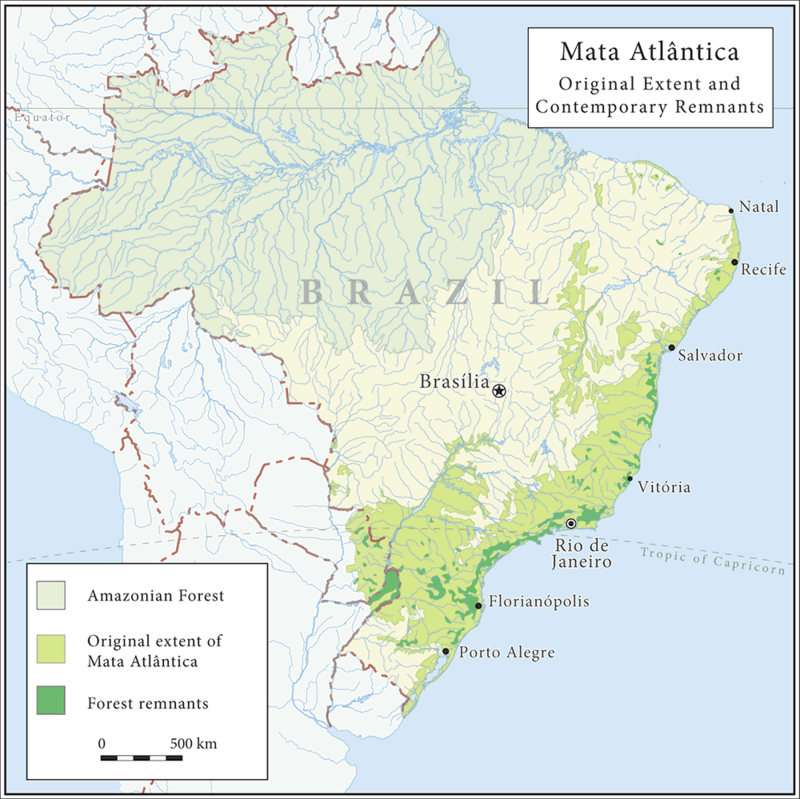 Over the past 500 years the Mata Atlântica has undergone drastic shrinkage as a result of the progressive conversion of land to farming and urban development. 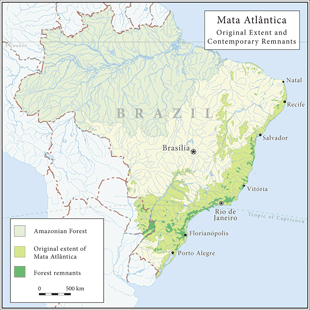 Map 1 shows the pre-Columbian extent of the Mata Atlântica and the current remnants – approximately 8% of the original area – of this forest. Discussions of the pernambuco habitat usually equate its erosion with that of the entire Mata Atlântica, due to a misconception that pernambuco was originally found throughout the Atlantic Forest region. However, the shrinkage of the pernambuco habitat is significantly more serious than that of the Mata Atlântica in general. Even in pre-Columbian times pernambuco grew only in very restricted areas where the right combination of climatic and soil conditions were present: the northern part of the region, within 100 km of the coast, from the Rio Dolce (just north of Vitória) up to Natal. Map 2, an enlargement of this area, shows the original Mata Atlântica, the original extent of pernambuco habitat (based on contemporary soil and vegetation data), and the current pernambuco forest. These remnants constitute less than 5% of the original growth of what was never more than a small fraction of the Mata Atlântica as a whole. Because of this drastic reduction, pernambuco has recently been added to Appendix 2 of the Convention on International Trade in Endangered Species of Wild Flora and Fauna (CITES [link: http://www.cites.org/]). This treaty, signed by 173 countries, is a mechanism to curtail the overexploitation of species that are endangered of affected by international trade. Map 1. Mata Atlântica: original extent and contemporary remnants.The original extent of the Mata Atlântica is from the Mapa da Área de aplicação da lei no 11.428, de 2006 (Map of the area of application of law 11,428 of 2006), available at www.ibge.gov.br/home/geociencias/recursosnaturais/mapas_doc6.shtm (accessed 10 May 2010). The extent of the Mata Atlântica forest remnant is from the 2004 Mapa de biomas do Brasil (Biomass map of Brazil), available at www.ibge.gov.br/home/geociencias/recursosnaturais/mapas/mapas_doc1.shtm (accessed 10 May 2010). Map 2. 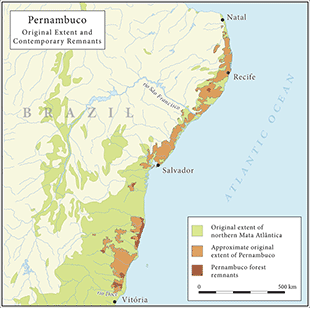 Pernambuco growth: original extent and contemporary remnants. The original extent of pernambuco growth was estimated by merging the areas for the soil types PAC, PA, PV, and PVA from the 2001 Mapa de solo do Brasil (Soil map of Brazil), available at www.ibge.gov.br/home/geociencias/recursosnaturais/mapas/mapas_doc3.shtm (accessed 10 May 2010), and the coastal forest areas on the 2004 Mapa de vegetação do Brasil (Vegetation map of Brazil), available at www.ibge.gov.br/home/geociencias/recursosnaturais/mapas/mapas_doc2.shtm (accessed 10 May 2010). The intersection of these two maps was superimposed on the original extent of the Mata Atlântica. The pernambuco forest remnants map is the result of super-imposing the original areas of pernambuco growth with that of the Mata Atlântica forest remnants. The PAC, PA, PV, and PVA soil types approximate the even more restricted areas of tabuleiro deposits. There are small areas of tabuleiro forest vegetation in the state of Rio de Janeiro and southern Espirito Santo where pernambuco may have been and may be native, but which are too small to show on this map. Note: These maps were produced by Brian Ally and IPCI-Canada by combining or superimposing areas covered on maps produced by the Instituto Brasileiro de geografia e estastística (IBGE, Brazilian Institute of Geography and Statistics). We wish to thank Wm. Wayt Thomas, PhD, Elizabeth G. Britton Curator of Botany, Institute of Systematic Botany, the New York Botanical Garden, for his guidance in the use of this data.